It is usually about 1.50 m wide and rises 30cm above the water line. 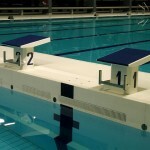 It is usually equipped with starting blocks, or even touch pads. The mobile quay can fully close off one end of a pool along its full length and the full depth of water. Its sliding movement is transmitted by toothed wheels or pinions which run on corresponding racks fixed to the bottom of the pool or along the vertical pool walls. 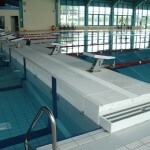 It will slide along the length of the pool and can be stopped at different positions, usually at 33m or 25m. 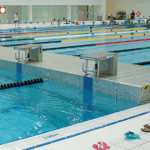 In a 50m pool (built with a length of 51.50 m to compensate for the width of the platform), it can be used to form two 25m pools either for competition and warm-up or to receive two competitor groups at a time. As with our other equipment it is fully functional in dry conditions to allow easy testing, maintenance and cleaning, if required and if the pool is being emptied.